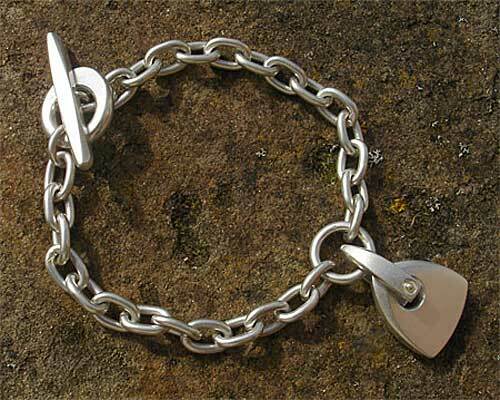 Silver Chain Bracelet For Women : LOVE2HAVE in the UK! This luxurious women's silver chain bracelet not only looks good substantially but also conveys a spiritual aspect too in that a triangle represents true feminine spirituality. It is a symbol of high power denoting the divine female goddess and the truth in her wisdom and knowledge through the number three. This number is representative of the spirit realm or the Heavens and connected to the Celtic idea of a trinity. The links are all made from heavy round wire formed into a chain. 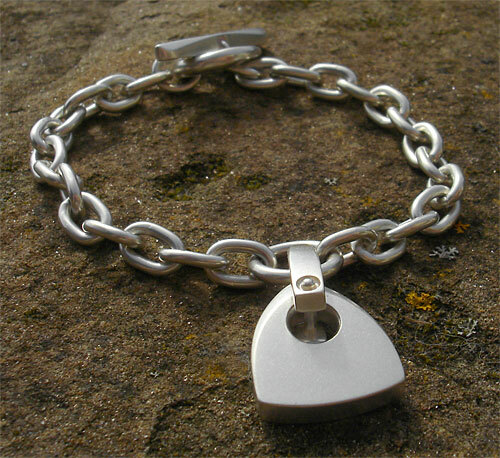 There is a large shaped triangular logo on a silver riveted stirrup that measures approximately 20mm x 17mm. The chain comes with a stylish T-Bar fastening. The silver finish, being a luscious, silky matt, subtly reflects the light and therefore avoids the tacky feel of cheap over polished silver. The standard size is 7.5 inches, but we can accommodate other measurements too if you so wish. Email us for further details.